Blurb is a creative self-publishing book company that enables anyone to create, self-publish, promote, share, and sell his or her own print and ebooks. Blurb books are bookstore-quality and photographers, designers and book-lovers all use their service. A customized, self made gift is the best gift anyone can give. I've given photo books as gifts before and the people receiving them always were touched and appreciated my gift more than something you can just buy in store. 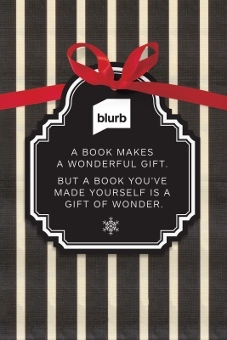 With the holiday season only a couple of months away, Blurb's 2013 Gift Guide is now out for you to find inspiration! The Gift Guide is also an instruction guide for how to make a beautiful Blurb book gift for anyone in your life. For those who like to get a head start on their holiday gifts, you can create your own Blurb book and save 20% from October 1st to October 7th, 2013 with code EARLYBIRD20. Happy book making! Disclosure: This post contains affiliate links and I was financially compensated for this post. The opinions are completely my own based on my experience.